Clicker training can be used for just about any command you would like to teach your dog - or for that matter a cat or a horse! The concept is simple - you ONLY click if the dog does what you wanted it to do. 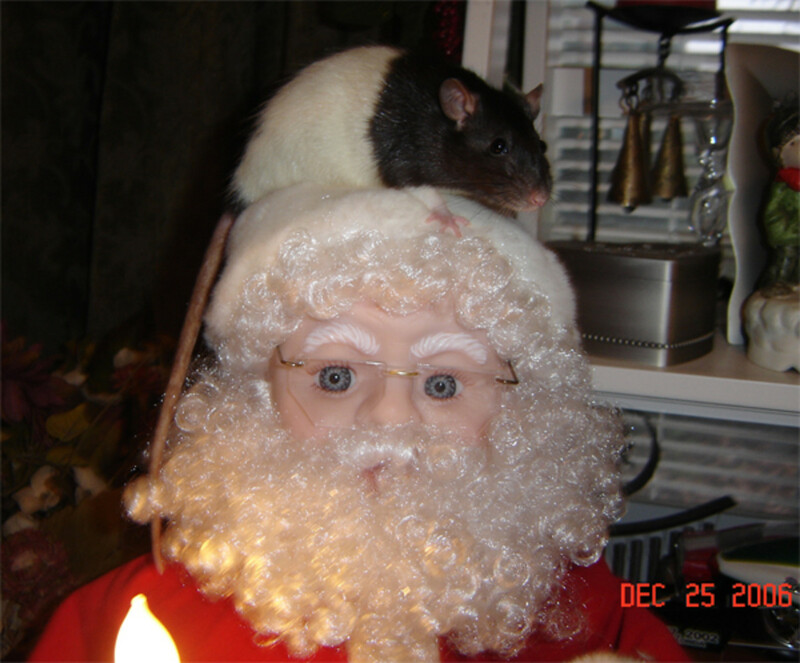 If the desired behavior does not materialize, no click/no treat. If the dog does do the desired behavior, click and treat. It is just that simple. Now that said, let's try a real behavior and see how the clicker works. This actually happened to me this week and I was very glad that I happened to be working on this particular behavior already. If I had not known what to do, it could have been a huge catastrophe resulting in a trip to the vet or possibly surgery on the dog. I was in the kitchen making dinner when I heard Griffin (who is an almost 9-month-old malamute puppy) chewing on something in the dining room that made a definite noise - as opposed to squeeze toys. I turned quickly and caught a glint off it - as in glass. He was totally into chewing this thing and was obviously enjoying it! Bob had just moved the refrigerator out for cleaning and somehow I figure a piece of glass had been under there which we must not have seen. But Griffin had somehow seen it! Not to panic - that was the solution. I quickly grabbed my clicker and a few treats I have at the ready for impromptu training. I did not want to advance on him too fast knowing that this would inevitably provoke the 'keep away game'. I calmly got his attention. 'Griffin - hi big boy'. No sudden moves and no high-pitched voice to lure him into the chase situation. We work on a technique called priming the clicker at times. You merely click once and offer a treat - for no reason except to get their attention. I use this sometimes to get him to focus and at the moment, focus was definitely called for. I did the priming click and still he did not drop it! He was interested but he was still more interested in the piece of glass. He was not dropping it even though he knows the game. I had his attention though so figured he would not run away since treats were surely involved! I approached him slowly and calmly and proceeded to just 'show clicker'. From working with him so much, he knows if he sees the clicker, there are potential treats involved and he needs to do 'something' but as yet he hasn't figured it out - as in 'hmm - what does she want this time?' Even though I had primed the clicker and hoped he would drop the glass so as to get the treat, he was in effect 'not biting'. I slowly put my hand out underneath his mouth where he was happily chewing on the very large but thankfully blunt piece of glass - I did not see blood yet so I was hoping this was good! He looked at my hand and chewed a few more times (much to my horror) and then tipped his head back - oy vey - I can picture it sliding down his throat now but I think he was just toying with me! He eyed the clicker again and then reluctantly let go of the deadly object and let it drop to my hand. CLICK - major treats - he got the whole bunch I had. 'Good drop-it, Griff, good drop-it!' And then I fainted on the floor - okay not really!!! Whew - that was a tough one. My point here though is - there will be times when your dog picks up something that is dangerous, potentially life-threatening even - and you have to have him or her drop it and drop it NOW. Chasing the dog will prolong the exercise and probably net you having them swallow it or bite it anyway. Wrestling it from their mouth is equally dangerous because in all probability, they will swallow it or bite into 'it' - whatever it is not to mention your hand! Let's think about it - it could be a bird - it could be something poisonous - it could be your ROAST that they have craftily slid off the counter top (this unfortunately has happened to me)! The important thing to remember is that you must remain calm - and you must give the command ONLY and I repeat ONLY when they drop it and perform the task by letting it go! After that little near miss, I decided to diligently embrace the command 'drop it'. This is actually pretty easy to incorporate in a variety of ways as I quickly realized that something not overtly tantalizing was not going to get Griffin's attention so I could practice it! I have plans to go and buy some large totally impossible to swallow meat bones and practice with those although I have to be very careful in introducing these with our other malamute anywhere in the vicinity. In the meantime, I am practicing in the following ways. I use the command 'leave it' to mean a myriad of things - do not by any circumstance lick that puddle of gosh knows what on the street - keep on walking. Do not touch that piece of food I accidentally dropped. I use 'bring it' to mean I have thrown something over there and I want you to go get it and bring it back to me (the old fetch). I use 'drop it' for absolutely do not chew it, do not pass go, do not do anything but drop it into my hand or at my feet NOW. Trying to get a malamute to consistently 'engage' in one command is challenging so I find that I have to go away from the command, come back at it, change it up a bit over and over just to keep him focused. Sometimes when I am sitting reading or watching TV, Griffin wants my attention (don't puppies always want attention?) It becomes a great opportunity to train him without him even thinking about it as training, thus eliminating the stubborn malamute factor! Since malamutes are notoriously hard to train on repetitive training tasks, it makes sense to sneak up on him and train him whilst he is unaware! He thinks we are playing when in fact, he is working! At any rate - I take a favorite toy. I throw it a few feet away and give the command 'bring it' if he goes after it. If he is playing the game, it works - if he chooses not to go get it - no click, no treat - no loss! However, for the most part, he likes this game because he gets to gambol about the living room so he runs to get the toy. He trots back with it and for a while, likes to play games with it as in 'I have it - you don't - try and get it away from me' - which I have no participation in. I just go on reading, writing, watching TV. When he finally realizes that there is no reward for this part of the exercise, and he must do something ELSE to get the treat that he knows is sitting in the dish on the end table, he starts to think. When he finally grasps the concept of opening his mouth - but not a SECOND before - and actually DROPS the toy, I immediately say 'good drop it' in my most enthusiastic voice - click and praise - treats! We repeat this until his mental midget of a brain tires on the subject or he decides he wants to be creative and do sits and downs and paw shakes instead of drop-its. Thus is the life of a malamute trainer - who is training whom you might say. I have been moving on to refine what I want and I'm getting closer to that being a reality. If I clicked once for dropping it onto the ground, I don't have to click it again - I can now click it that it must drop into my HAND. That is really the idea of clicking. You mold or shape the behavior until you get the final result that you wanted. It might do well for them to drop something onto the ground, however, if they drop it onto the ground, it then can be picked up again by the same dog that just obediently dropped it - or better yet - the other dog - so I am working towards always dropping it into my hand as there I know it is safe. 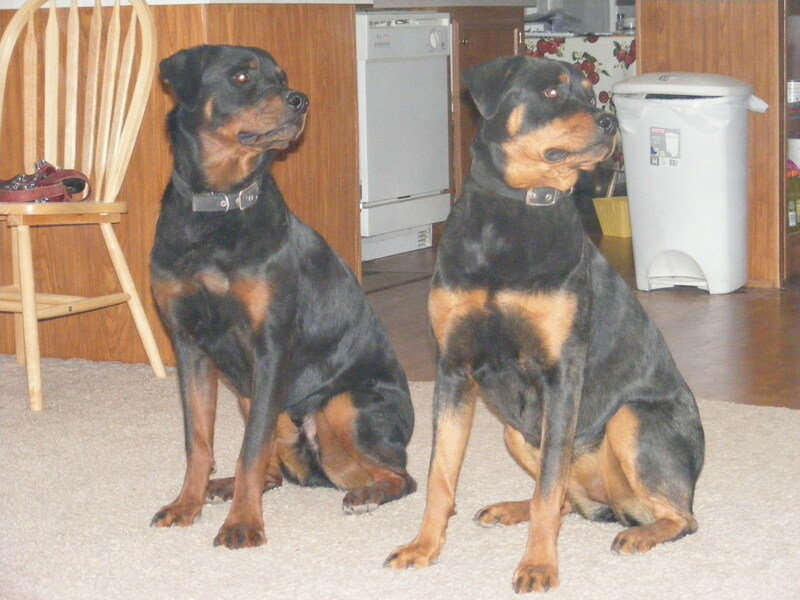 A clicker is but a tool in training a dog and there are no surefire ways that work for everyone or every breed. 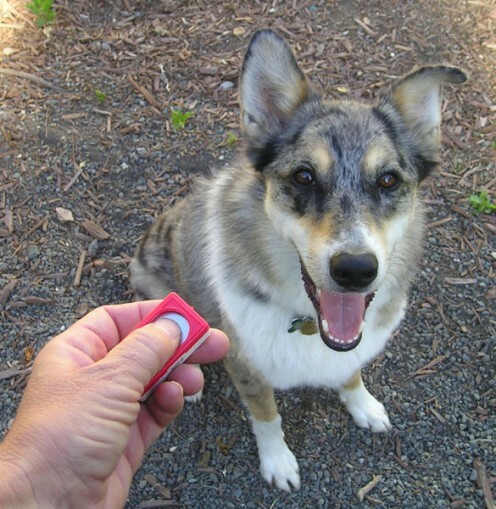 I am finding, however, that once the shaping stage of behavior is over, it is important at least for my breed (malamute/psycho dogs) to move on to obedience and the clicker seems to be a very powerful reinforcer of behaviors. I prefer in all things to work on a positive rather than a negative system. I always end on a high note - if Griffin or Denaya for that matter will not do what I want, I switch to a command at the end that I know they will do. I issue it, click, reward and we both walk away happy - I may be frustrated but I don't end any training (at any level - casual or formal) on a failed command. Not good business as far as I'm concerned. As an aside on failed commands - sometimes I rethink what I was asking and if the command was too complex or the dog just doesn't seem to be interested in that particular thing I've been working on, I try and change it up the next time and rethink it. Of course with a malamute, there are simply just times when the command isn't going to work at that particular moment no matter what. Changing to something else doesn't mean I've failed - it just means for that moment it wasn't working. There are many, many commands you can use the clicker for and incorporating the commands and the device into everyday activities is a great hobby! It can be used for something as simple as practicing a 'roll over' - useful for the vet when the dog is as big as a small pony. I practice this one on the bed while I'm reading - if he does it, click and treat. If he chooses not to do it - oh well! There's always tomorrow! 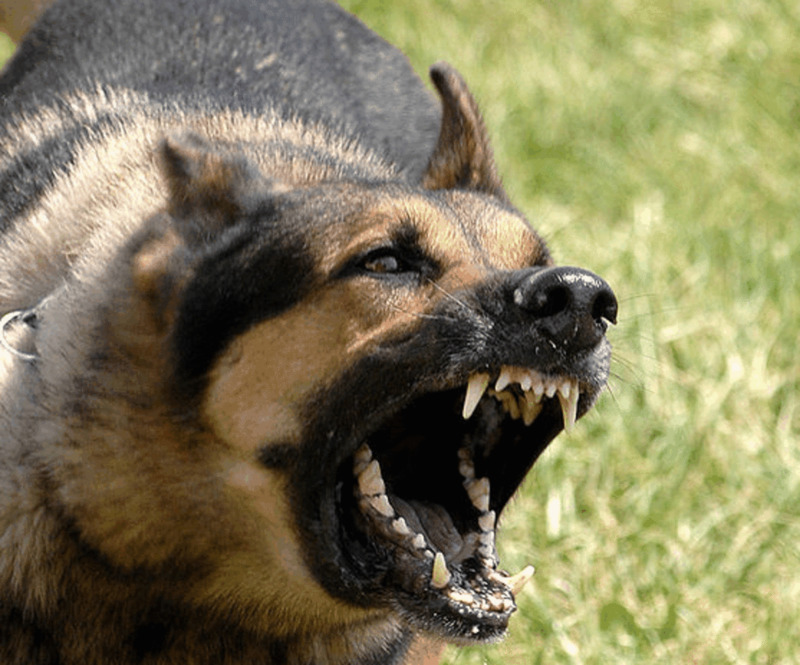 Clicker Dog Training - Does It Work? Thanks for reading and most dogs I have had the same experience - malamutes- not so much! You have to be creative to say the least.....and talk their language too -or howl it! Great Hub and wise advise. I have never need to use a clicker but my dogs are always so well trained by me their first your, then after that they understand what to do. I think I talk pet language, we all seem to just understand each other. Thanks again!